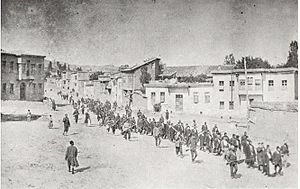 After the Dutch Lower House recognized the Turkish mass murder of Armenians in 1915 as a genocide, the Turkish Ministry of Foreign Affairs reacted. In a statement, the ministry said that the Dutch decision is inappropriate as the Netherlands ‘looked the other way’ during the genocide in Srebrenica. In 1995 Bosnian Serb forces killed 7000 Muslims while Dutch UN peacekeepers stationed in Srebrenica failed to protect the population. The Dutch were accused of complicity for ignoring what happened there.